June has been was a very interesting month for me. I opened up a Twitter account @MoreDividends. On there I will be posting articles I read and like, as well as my thoughts as they happen in real time. Follow me to stay up to date. I will be updating the Dividend Income and Portfolio pages today as well to reflect the changes that have occured. Also during the month of June I had my first article published on Seeking Alpha. Now let me get to the details of what all has happened during the month of June. During June, I did start a new position. After writing my article More Dividends Portfolio Allocation I decided to look into some other sectors to add to my portfolio. Because of earlier decisions in my investing career I decided to look in the REIT sector and what I decided to do was I Bought: Omega Healthcare Investors, INC.
During the month of June some of the Dividends that I received were actually raises for me. It is always nice to get a raise for doing absolutely nothing! 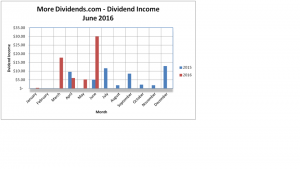 During the month of June I received quite a bit of Dividend Income. All dividends were reinvested. 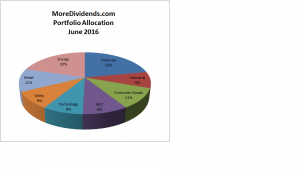 In total June accounted for $29.95 of my projected 2016 Dividend Income. 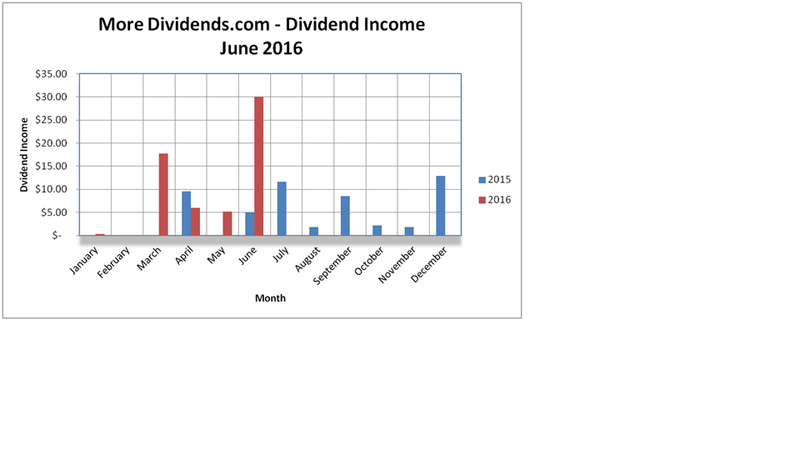 June was the last month of Q2 which produced $41.20 of Dividend Income for me. I am feeling better about my allocation right now but I will continue to observe it as time goes on. As more new capital is invested it will have smaller impacts on the overall allocation of my holdings. June 2016 marked the first time that I had an article published on SeekingAlpha. I hope in the future to be able to have more articles published on Seeking Alpha and will keep everyone updated about this on my Seeking Alpha Articles page here on the blog. Here are the SeekingAlpha articles that I had published this month. June marked my highest number of post in a month with 7. Here are the articles that I posted this month. Flowers Foods – Any Upside? Bought: Omega Healthcare Investors, INC.
As you can see, I had a lot going on during the month of June. A lot of dividends were paid out which help me drive growth in my portfolio, along with some dividends getting raises. I have been able to increase the number of post on the blog which is a goal of mine but only if the post continue to offer something for the reader. Moving into the future I am looking to start growing some passive income streams so that I can use the income in my MoreDividends portfolio. I am enjoying this journey that I am on to achieve financial freedom and am glad that you have chosen to be apart of this journey with me. Hopefully I can have a productive month moving forward into the month of July. I look forward to hearing from you! Please feel free to leave me any questions or comments! I remember reading your Flowers Foods article right after making my last purchase. Gotta love a little confirmation bias from time to time. Thx for the update. Thanks for reading. I am glad it gave you some confirmation. I hope to be publishing some more in the future. Thanks for stopping by! BOOM! Great month more dividends. Isn’t it great receiving raises from companies without lifting a finger? I didn’t realize Wells Fargo increase their dividend this week. Congrats on the record setting month and setting the table for future prosperity! Thank you. Wells Fargo announced it on April 26 but I just now received the raise. I felt it would be clearer if I listed the raises as I received them, not when they were announced. How do you announce your raises? Yeah it was a good month for me but I have a long way to go in building my snowball. I always refer to this quote when it comes to this ……. Great job with your dividend income. New additions to your portfolio along with dividend increases all help to keep that dividend snowball rolling and growing. Thanks for sharing. Thank you. Yeah I have a long way to go but I can appreciate how far I have came so far! Thanks for stopping by DH! June sure grew a lot from what you saw last year! Soon you’ll be hitting $100+ per month and in no time it’ll be at 1k+. Good luck! Yeah my YoY was pretty good for the month of June but I also didn’t have much invested this time last year. Hopefully as time goes on I can continue with good growth in the portfolio. Right now I’m just aiming for $200 in dividend income by the end of the year. I feel like next year $100 per month will be achievable. I appreciate the motivating words. Thanks for stopping by! Hey…nearly $30 of dividend income in a month is something I’m hoping to hit around the end of the year. I was just a bit shy of $20 for the month of June. Gotta love the passive income rolling in. Good luck on your journey. Thank you. Yeah, I’m starting to get my little snowball rolling. It has been a fun journey so far I can’t wait to see how far the journey takes me! Thanks for stopping by! Looks like a busy and productive month MD! Solid dividend total for the month, 3 raises, a new purchase and adding another potential income source to the mix with SA is awesome. All the best. Thank you JC. Yeah it was a pretty good month for me, I know that if I want to help build my portfolio faster I will need to build some other streams of income. I wish the best for you and thanks for stopping by! Hi MoreDividends — nice blog and all the best with your dividend investment journey! Cheers to MORE DIVIDENDS! Thank you. So far it has been a great journey in which I have met some wonderful people. Thanks for stopping by! Congrats on a great month. Kicking off Twitter and SA in the same month, nice work. Then there’s the dividends, great job there too. OHI was a smart addition to your portfolio. Thank you for your kind words. Hopefully I can continue to build more great months moving forward. Thanks for visiting!